Are you racking your brain trying to figure out what to get dad this Father's Day? Believe it or not, it's this weekend, so time to get serious about a gift for dad. We have no time to waste! Red Envelope comes to the rescue though (maybe) with some jewelry gift ideas. Just because he's forever on the go doesn't mean he can't keep an eye on the people he loves. 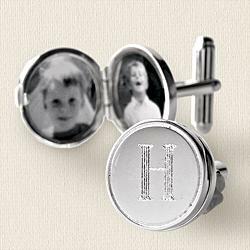 These unique sterling-silver cuff links not only keep his sleeves in the right place but his heart as well. Exclusively from RedEnvelope. rectangular lockets measure approximately 1/2" x 5/8"
Does dad already have plenty of baubles? Then how about some place to toss them into at the end of the day? Or, I also like this sterling necklace tag you can have personalized with his initials. Exellent idea. I hadn’t thought of that, but yes, perfect for weddings too.